In the 1980’s, the Friday The 13th films were always scrutinized for their level of violence upon their release into theaters. 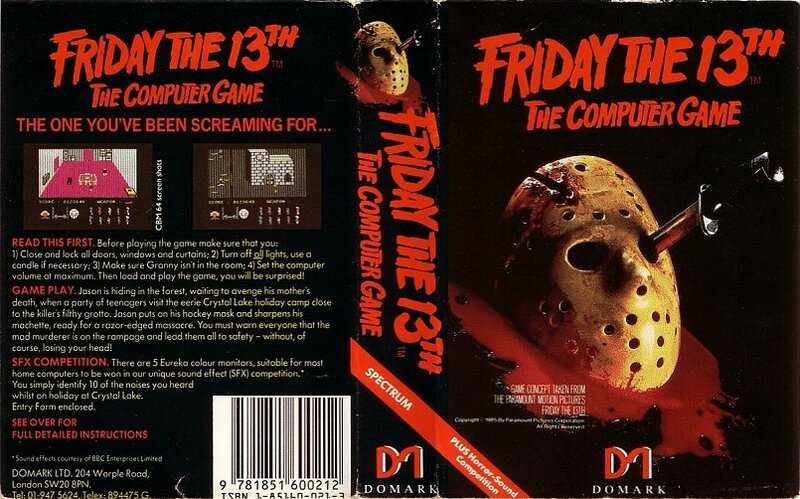 However, there was also a controversy in the U.K. over Domark's Friday The 13th computer game. Of course, when people think of a playable Friday The 13th game they automatically think back to the ceremoniously trashed Nintendo video game with the infamous image of Jason from Friday The 13th Part 7: The New Blood on the cover. 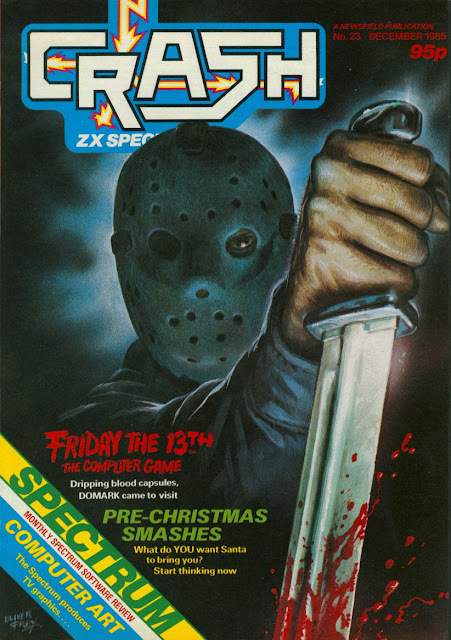 That wasn't the first electronic foray into Crystal Lake, however, as the franchise first appeared in video games on older computer systems such as Commodore 64, Spectrum, and Amstrad. Domark went out of their way to garner attention for the game, notably through gimmicks and tricky advertising. On the order form (posted below) for the game, a disclaimer to those with nervous compositions was stated. 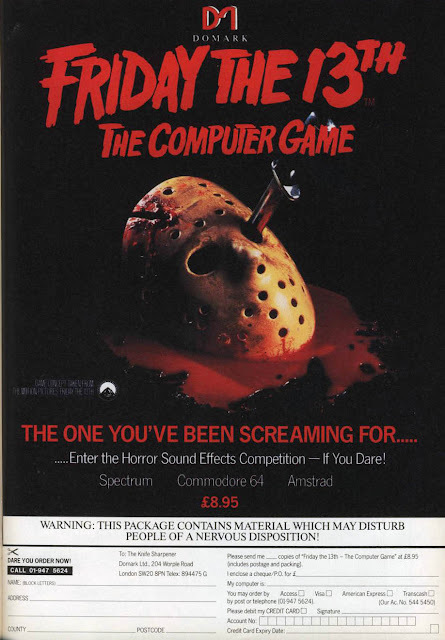 On that same order form, there was also the mention of a competition where you would try to identify sound effects at the conclusion of the game. An even cooler idea was to include blood capsules that were given away with the game. So much hype was behind the game that Spectrum gave it a cover story on their Crash magazine, something similar to Nintendo Power. The magazine cover and story brought about a huge controversy with parents, concerned with the content of the game and what the magazine was promoting to children. Many parents wrote into the magazine expressing their disdane. Crash Magazine printed the letters in a later publication and addressed the issue whereas they stated it was a fun article, and that the magazine’s target audience were teenagers to young adults. As you can see, the Friday the 13th films will always be a polarizing topic for censorship, but even more-so was a huge issue back in the 1980's before the Horror genre and Primetime television began having the freedom to show much more violent content. If only fans could get an official video game for the franchise now with this type of promotion!